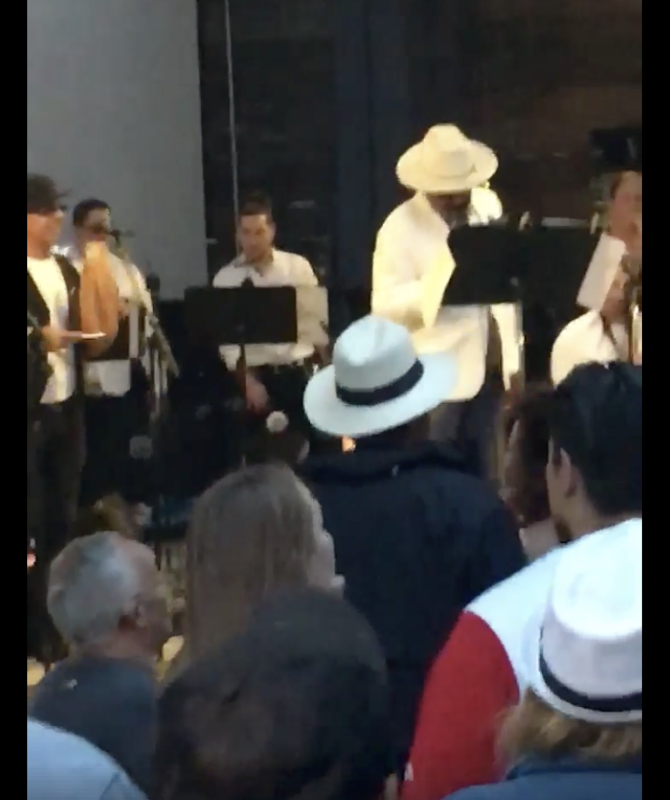 Held in downtown Los Angeles at the plaza de Cultura y Artes (Place of Art and Culture) on Sunday, May 20, 2018, the Cuban American Festival sponsored by La Plaza de Cultura y Artes, Yambu productions ran from 11am until 8pm. In celebration of Cuban Independence Day hundreds of international guests gathered together in the colorful, packed plaza for a day of festivities a la Cubana Estilo Cubano (Cuban style). Pre-sale tickets were available in advance at Cuabanamericanfest.net. Upon entering the busy intersection, you could feel the electricity and energy in the air. Everywhere you looked there were people lining the sidewalks and filling the streets. There were so many cars trying to snag spots in the various (privately owned lots) that we sat in lines, not moving and waiting patiently for cars to leave just to get a spot. While waiting to park I was able to take in all of the colorful sights and stirring sounds all around. There was so much going on that it felt like an intense overload of the senses. Smelling the rich flavors of international foods from street vendors and food trucks all around, hearing the pulsating drum beats and seeing the vibrant colors all around. As I walked several blocks through downtown toward the Plaza, I was pleasantly distracted by the plethora of other events all around me. From mariachi band performance on one streetcorner to political protest group on another, to vendors lining the streets selling their arts, crafts and other goods. It almost felt a bit like a highly trafficked tourist area in the middle of an exotic vacation destination. The festive energy in the bustling center was palpable. You could hear the rhythmic Afro–Latin sounds echoing from inside the event venue all the way out to streets several blocks away. Everywhere you looked people wore clothing and accessories with Cuban flags, or other natinonal flags from the many other countries in attendance. Once inside, you were greeted by vendors lining the entryway selling T-shirts, bags and a myriad of accessories, with Cuban flags (of course), printed all over them. as well as paraphernalia from other Latin American countries. There were booths with instruments and other specialized items for sale. In addition, there were several tents selling drinks and traditional foods from across the Caribbean. One couldn’t ignore the sweet and savory smells of the spicy dishes everywhere. At the far end of the space was the stage. With so many talented performers in the lineup, many with specially reserved VIP seats couldn’t seem to stay seated long enough to actually use their higher rate seats. In-between the stage area at the far end of the plaza, and the main entrance, the walkways were filled with people of all ages and backgrounds wearing big smiles as they swayed the infectious music. While a wooden dance floor lined one end of the walkway just behind the VIP seating area, dozens of other attendees squeezed dances anywhere they could. The perfect space for non-dancers well, some spectators come just to do that– spectate. Some even bring their own lawn chairs as they eat, drink and enjoy watching live entertainment from the comfort of their seats. DJs played a mix of different style salsa, cha cha-cha, Cuban timba, reggaeton, and other tropical dance music. Everywhere you turned, people were dancing in pairs, groups, and even solo to the infectious beats/sounds. Featured performers included the Arp Band, also from the LA area, Charanga Calixto & Timbala, and Las Chikas. One thing that I love about this festival and style of dance is its variety and expressiveness. We danced both LA and Cuban style in pairs, solo, as well as Casino Rueda (a circle of 4 to countless pairs of dancers simultaneously following cues from a single caller, while constantly changing partners and traveling around the connected circle). Some also danced folkloric/traditional rumba (hailing from, and paying homage to Cuba’s strong ancestral African heritage, whose influences dominate modern day Cuban art and culture. An all levels Casino Rueda class was taught by local instructors Robert Morales and Laura Cristina. Another highlight for many is the Cuban “line dance”, in which participants form two single file lines directly across from one another. As they stand face to face, they work up a serious sweat mimicking fairly simple moves that just one or two leaders initiate. Now local Afro-Cuban dance instructor Ludiz Beneditez passed the “leader torch” my way mid-song, so I had to come up with moves right there on the spot as dozens of eyes shifted their focus from him to me), following my every move. As we threw our hands in the air, and waved them like we just didn’t care, we sang and yelled out blissful cheers. We had a blast bonding with both old friends and strangers alike, over this highly social, friendly dance that literally brings everyone together and sums up the entire experience. Line dancing is especially fun in part because of its inclusivity. From beginners to advanced, young and old, even wheelchair bound participants are all able to jump in the line anytime and join in the fun. Some of us worked up such a sweat that we needed beach towels to help keep dry. The largely outdoor venue helped keep attendees cool and dry, dancing out in the fresh open air. The evening closed with a performance by the iconic Pedro “Pedrito” Calvo (former singer of Los Van Van) and his band. Paying tribute to Beny More, these special guests from Cuba brought the crowd to their feet as Calvo reached those legendary notes. From the spontaneous drum circles of musicians improvising off of one other, and spectators chanting as they circled around them, to the variety of dance and music styles, the rich food and culture, friendly, multi-cultured people and more, this is a special experience not to be missed. I met people from as far away as Israel, China and of course from all over Latin America. Showing just how unifying music, dance, and festivals like this can be. Don’t miss this special chance to enjoy the sights sounds, smells and tastes of Cuba right in your own backyard, as the contagious Cuban rhythms move your body and soul.